a) awesome idea, I love it! b) heck no! I made a wreath this past weekend, I will post it tonight. With all the hard work it's bound to be up for a while. Hint - it's argyle! Eee! wreaths are awesome. Ours lights up. So what if I have to duct tape an extension cord to the door? It has LIGHTS! you can just hang little hearts and candies on it after Christmas and call it a valentines day wreath? Beautiful wreath. But don't ask me timing questions. I take things down on the 6th. (Or the weekend closest to it. )A friend's parents leave everything up until St. Patrick's though. I love your wreath and say leave it up for as long as it makes you happy. I am totally stealing your mom's idea of the card catalog cards for Dewey's birthday, it is nerdily awesome! My mom is (in case you didn't guess) a retired Librarian. Isn't she GREAT!? I grew up knowing there were TWO important 'Dewey's' in American History. Thomas AND Melvil. I miss card catalog cards. for an entire year. And I loved EVERY SECOND OF IT! Even though it was red, it worked for Fall, Christmas and Valentines day... and then I just got lazy. HAHAHA! Your door looks wonderful. Keep it there! Mine is all chipped and one side is scrached from when the dog got out and found his way back from around the back of the house. You're doing great on collecting cans! I'll post one too. Beautiful wreath. Even in February, winterberry, holly, laurel, balsam all good. Plastic Santas and candy canes, bad! What an awesome thing! Good job helping humanity. Cans for comments is the best idea I've come across in a long time! I will have to participate some time too! Great job with the cans for comments.Nothing wrong with leaving the wreath up as long you want.Don't let anybody tell you otherwise. 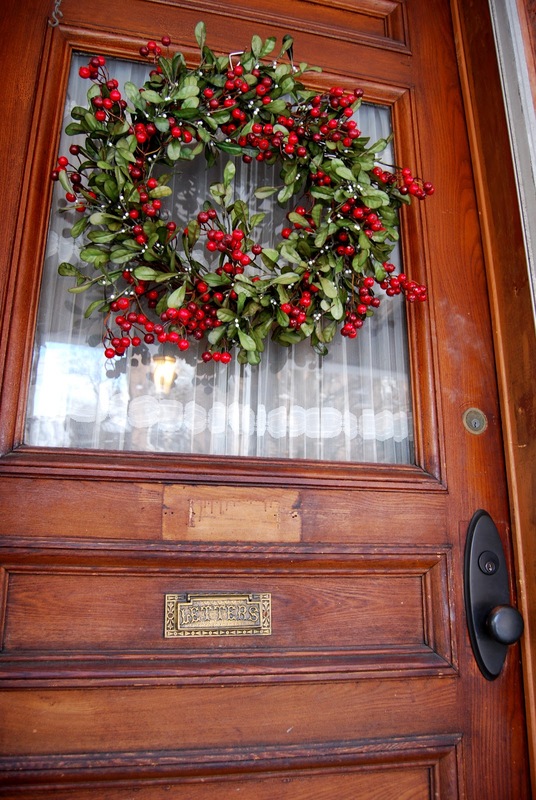 I love that wreath and you can leave it up all year! Your wreath is beautiful. Definitely leave it up til feb!